First introduced in the 1990s, MAN Diesel describes its Turbo’s 16/24 GenSet as a proven workhorse that has been employed by a broad range of applications and whose continuous redesigns have kept it competitive. MAN Diesel & Turbo has introduced several, different generations of the L16/24 over its lifetime with a constant focus on achieving ever longer TBOs and increased output. The HFO-powered engine has shown its versatility and has been employed as a GenSet aboard many different types of vessel – from handysize bulk carriers, tankers and general cargo vessels, to small and medium-sized reefers, container vessels, ferries and cruise ships. It has also served as power plant in some of the world’s hottest climates, as well as some of the coldest inside the Arctic Circle. Furthermore, the engine has also found favor as a laboratory unit for testing lubricating oils and has also found a niche as a test unit at different technical universities in Europe and South America. Aesthetically, the streamlined, exterior design of the L16/24 – uncluttered by tubes and pipes – has also been recognized with a prestigious ID design award. • Performance – engine output at 1,000 and 1,200 r/min ranges from 450 kW (5 cyl.) 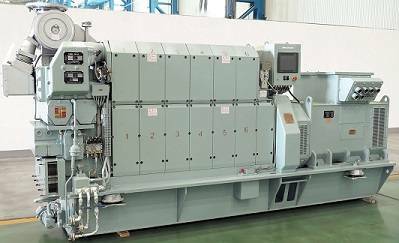 to 990 kW (9 cyl.) with each L16/24 engine a class leader in terms of specific weight (kW/kg). • Compactness – with maximum dimensions of 1 × 2.4 × 5.8 m, the L16/24 is the smallest engine in its power output class. • Lightweight – these compact dimensions deliver a substantial weight advantage compared to rival units. The L16/24 range weighs between just 9.5 and 13.1 tons. • Simple maintenance – as with all MAN engines. • Improved working conditions – the L16/24 operates with very little vibration and is fitted with sound insulation jackets that substantially reduce engine noise.